My Facebook feed is filled with political advertisements. They weren’t paid for by the Republicans or Democrats. They weren’t sponsored by PACs, Super PACs or Pac-Man. They weren’t put there by a t.v, radio, or space station. They were put there by my friends. They tell me who the job creators are, who the bad guys are, and who the fools are. They show me brilliant ways of taking things out of context and inventing new contexts. They tell me how a government should be run. In reality, they tell me nothing about my government. Fortunately last night, I got to glimpse the heart of government. No ads, no pundits, no screaming. Just people. 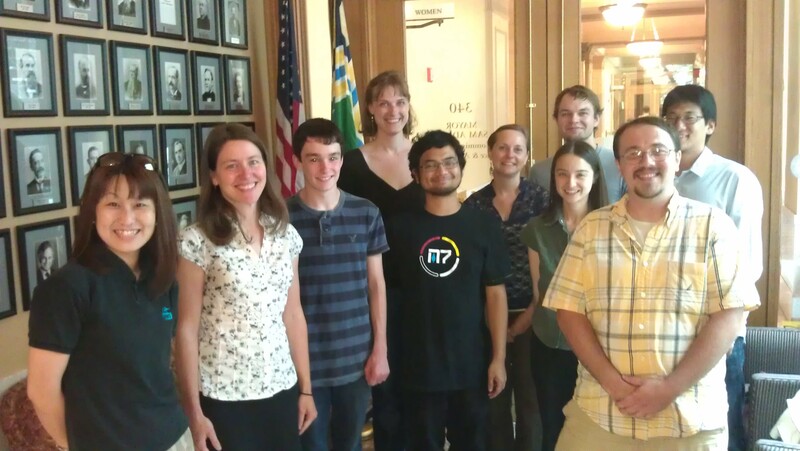 Our Teamworks team with Lisa, Portland’s Planning and Sustainability Director, at City Hall in Portland, Oregon. Lisa, the planning and sustainability director for the mayor of Portland, Sam Adams, took time out of her busy schedule to talk with our Teamworks volunteer group about The Portland Plan. Every 25 years, the state of Oregon encourages cities to create a “generational development plan” intended to identify and address the needs of it’s citizens. In April 2012, after 2 years, and 20,000 comments, the city of Portland released it’s plan. Created during a nationwid-recession when people are focused on today, it is impressive in it’s undertaking. It’s also remarkably forward-thinking. The plan tries to include, but go beyond, a long laundry list of specific needs and tries to help solve the problem of service equity in Portland. Equity of services is measured neighborhood by neighborhood, from the poorest to the richest; from the most diverse to the most homogeneous. Among other metrics, it measures whether a neighborhood has a good school, a grocery store, a public park, and affordable transportation – all of which are convenient. As Lisa explained to us, the source of the plan comes from two very different places – government and grass roots. The role of private small businesses, local non-profits, and grass roots organizations are every bit as important as the role of government. It tries to address the growing diversity of this city, which has gone from a population of 15% non-white in 1980 to 27% in 2010. (Portland Plan, Page 8). That trend is expected to continue. Outreach to the groups that serve the poor or disenfranchised. Using technology to show the diversity of each community planning meeting. Often, any given meeting wasn’t very diverse. Lisa was quite open and frank that this plan isn’t perfect. There are big challenges ahead such as providing quality public schools for members of the ‘creative class’ who are looking to start families and want to stay in the city. Also, because there are so many agencies and grassroots organizations involved in the administration of the city, it will be a challenge to get them all working together. It was only one meeting, in one mayor’s office, in one city, in our wonderful country. But it was open, engaging, and it spoke volumes about what government is when you pull back the inane rhetoric and look at what actually transpires everyday. Whether it’s in our police stations, courthouses, city halls, or schools, our government is manifested in people like Lisa who work hard everyday, trying to solve immensely complex problems, and try to create better futures for all of us. I know that this tiny post is just a single drop in the trillion-dollar ocean of election year insanity. And even though it won’t make a ripple, I’d still like to say how much I appreciate government officials like Lisa who take time out of their busy day to talk to average citizens about our collective future. It’s a government for the people, by the people. Yesterday’s gift of time … With our Teamworks volunteers, met with Lisa from the Portland mayor’s office to discuss the Portland Plan – a plan for people, by the people. This entry was posted in In the community and tagged civic planning, government, Mayor Sam Adams, Oregon, Portland, Portland Plan, sustainability, Teamworks. Bookmark the permalink.